"I feel like a little kid on Christmas.... Can't sleep at all. Woke up at 3:30 a.m."
That was the post I saw on the Bad Karma team forums before heading to the Salt Lake City airport to play at Living Legends III in Joliet, Illinois. It pretty much summed up how all of us felt that were going. By 7:30 a.m. a half dozen Bad Karma team members with their team t-shirts and gear stuffed into bags were making their way through security, ordering up some much needed coffee and eating some Cinnabons. Paintball fanatics every one. After a 3-hour flight (where Pat "Animal" Burns converted a woman from China to paintball after showing her pictures of playing with Randy Couture), we shoehorned all our gear into the back of a rental car and made our way through Chicago traffic to the field. And what a field it was. 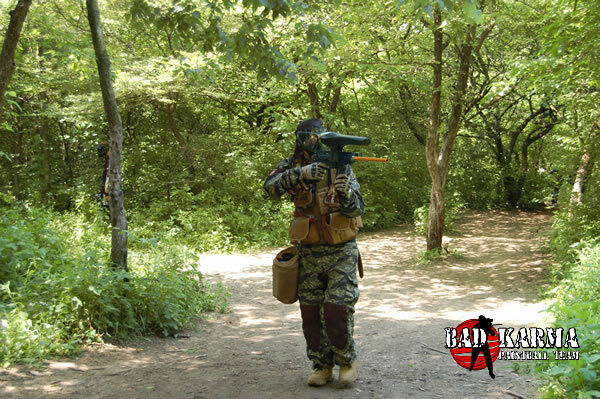 CPX Sports is one of the premier paintball fields in the world. In combination with Viper, the NPPL and many others, they set the stage for an amazing event. 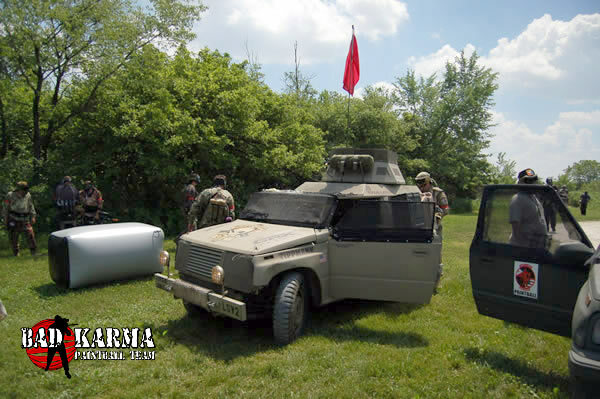 Tippmann and Valken had huge semi-truck booths with all the latest and greatest gear, along with Guerrilla Air, Pinokio, Dye, Angel and many others showing off impressive new products. Like a kid in a candy store, I had to be dragged away from spending all my trip money the first night. 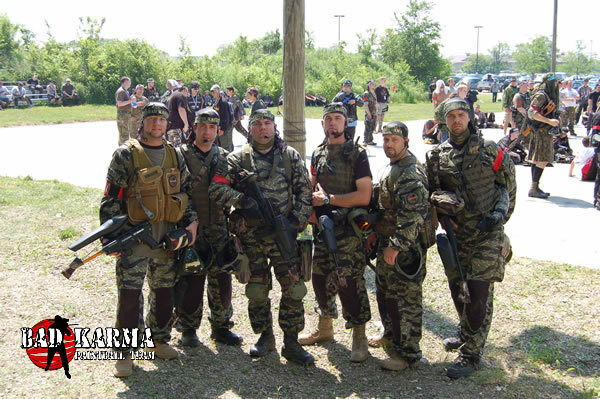 After talking with friends from Special Ops Paintball/Extreme Stitchworks, the Hellions and The Northern Gunmen, we found some authentic Chicago-style pizza and headed to the Red Roof Inn chalk full of both scenario and NPPL players, where we checked our gear and set in for another anxious night. The nice part about getting to know teams and players from across North America is that wherever you play, you know someone. 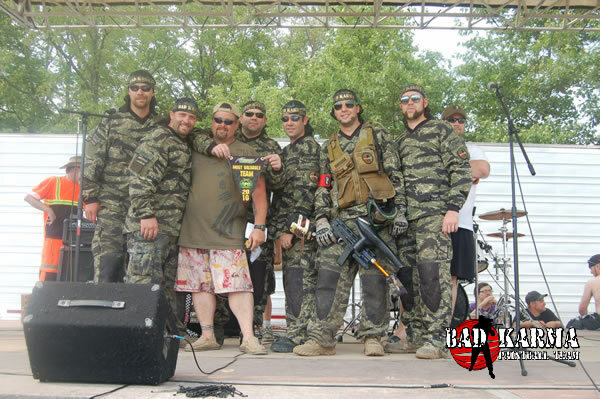 For our second Living Legends event, the Hellions made us feel immediately welcome again as we set up in the Tippmann tent the next morning, where we also met TSSOC and Four Horsemen—all Tippmann sponsored teams. Knowing the caliber of teams and people you're playing with definitely helps you hit it right out of the gate. As the game started and I saw roughly 700 of the 1400 people that came to play charge the field and felt a shot of adrenaline. Paintball on that scale is just awesome. But it doesn't mean that individuals and small units can't make a difference. Within the first five minutes we found our first objective and headed back to base, meeting up with other teams that had done the same. We were off to a good start. With most large scenarios a front line forms of massive proportions. Hundreds of players trade paint for the better part of two days. Living Legends III was no exception. 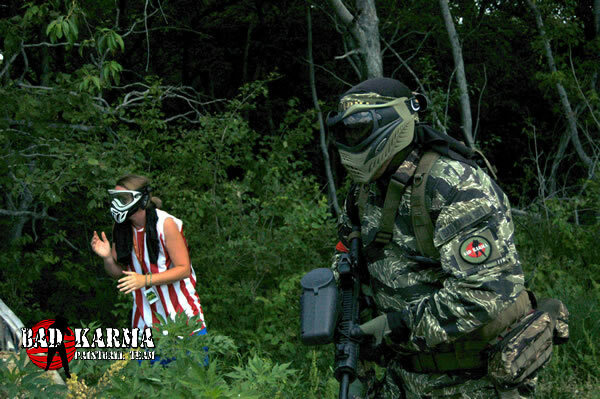 This year, front lines formed at the speedball fields. Fighting was furious, saw tanks from both sides roll up the field—including the Hellions Grindhouse—and extended down into the ravine. After the first mission, we saw some front line action, even coordinated some defense in the ravine as pushes were made, but eventually regrouped for the primary reason our 6-man squad came—to run missions. In a scenario like this, everyone does their part—from slugging it out on the front lines, to killing tanks, to getting as deep as possible behind enemy lines. We did a lot of the latter, which included 16 missions over the course of two days—11 of which would be successful. One of the most dramatic was in the afternoon of the first day. 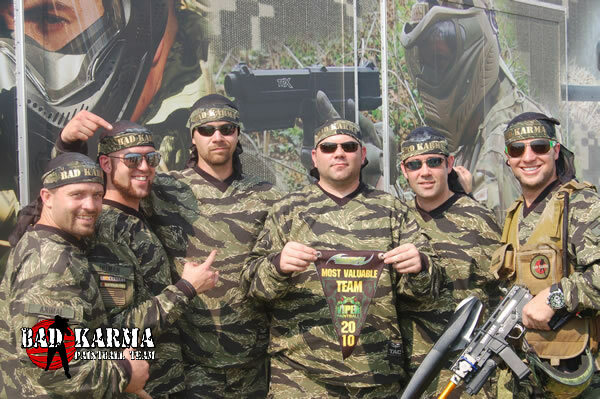 Nate "Swagger" Durbano, Pat "Animal" Burns and Shane "Candyman" Carlson, along with two walkons who had demolitions cards, walked right though enemy lines, blew the first base with a satchel charge and barrel tagged over 50 players in the speedball field on the way back to our lines. It opened up a nice advance and had them grinning from ear to ear. Later in the afternoon we took a helicopter (a pack with a rotor and rope for 5 other players) through enemy lines. It's eerie and makes you paranoid when you're the only players for your side as far as you can see. But you can sure be effective. After taking an unguarded objective with The Northern Gunmen and some other players, we hiked what seemed like an hour along the back tapeline and assaulted the enemy HQ. This was standard mission stuff for the game, and it really made you feel like you were having a true scenario experience. I highly recommend teams or walk-on players that can group up to ask for missions at your next scenario. It let's you experience the game from an entirely different perspective. As things wound down in the afternoon, it was time for the dinner battle. Picture over 1000 people rushing a central hill. At the top were slap sticks you had to hit to get points for your side. Along with the missions, this was how you won. Early on, Bad Karma Commander, Jared "Bad Karma Six" Bronson led the charge with two slap stick runs. I made it to the central bunker close to the crest of the hill sometime after. Pat "Animal" Burns was there, lighting up players as they made runs. We quickly made up a plan for him to pop up and draw some fire while I ran for a slap stick close by. Those moments always go by in slow motion, and this time it worked. Somehow I hit the slap stick. What I didn't do, however, was have an exit plan. 13 of my 15 welts from the event came a split second after. But for the scores of people that made those runs in the dinner battle and final battle the next day, you know temporary pain is eclipsed by glory (at least in your own mind). After some dinner (Thanks again Hellions! ), we headed out for the night battle. I'm not a fan night play, but if you have night vision equipment, it can be quite fun. 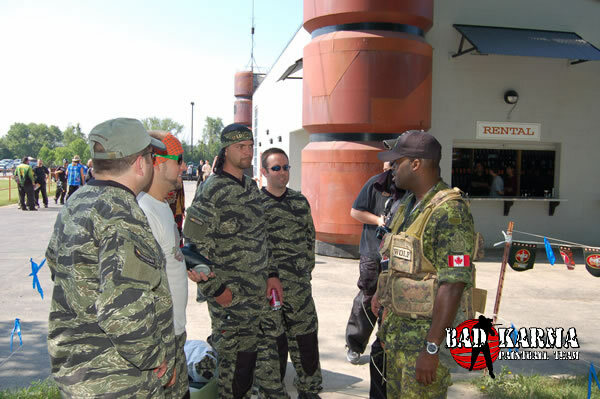 Unfortunately, there were heated tempers in this case because of a dead man talking, but it couldn't dampen spirits of players who just experienced an amazing day of paintball. A little sore and after more than one player on the brink of exhaustion in 95 degree weather, we came back to play the next day. The enemy was on to our helicopter and movement tricks, so missions weren't quite as successful. But we still managed to make a difference, including an intense base defense against a helicopter crew that had shot us down earlier. The front lines moved in the opposite direction the second day, traveling far back into our territory. As with many scenarios, it came down to the final battle. Standing outside the netting of the town and bombed out landscape for the briefing, you couldn't help but be in awe of 1400 people ready to play. Truly amazing. 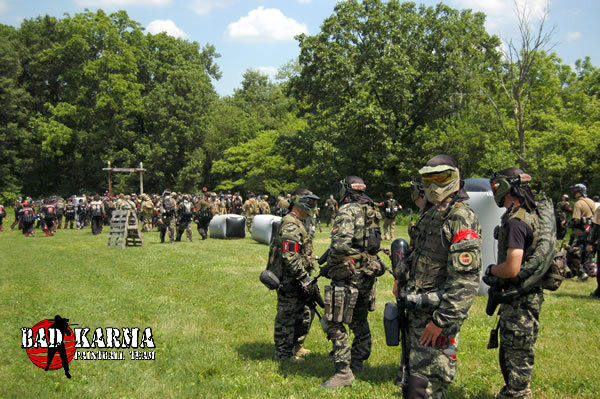 We stood at the entrance with TSSOC, anxious to defend whatever small lead we had. Game on brought a hailstorm of paint like I've never seen. Players were emptying entire hoppers blindly over the central hill to give cover to players making slap stick runs. A few Bad Karma players made it to bunkers on the hill while others took to the woods. Push after brutal push came. We coordinated several runs on the slap stick in the woods and held it for the most part. The hill saw heroic run after heroic run. The enemy took most objectives there at the end, so we were nervous about the outcome. In the end, we were part of the winning side this year. Both generals were gracious in recognizing the many, many contributors. Bad Karma received the most valuable team award for our side. It was a unique experience receiving this on a stage with hundreds of people looking on. 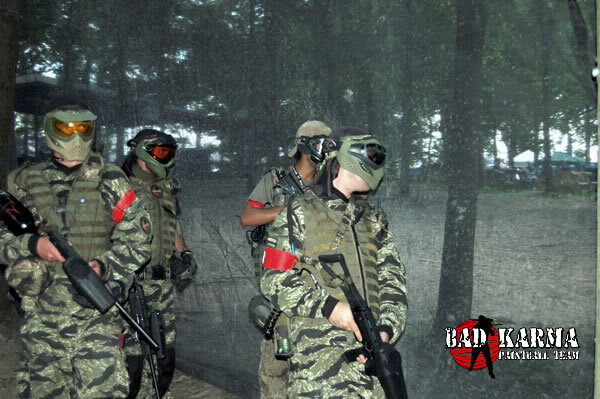 It's something teams before and after us will do and something that I will remember for as long as I play paintball. Thank you to all the individual players and teams that made this event so amazing. In particular, thanks to the Hellions, The Northern Gunmen, TSSOC, Four Horsemen and other teams that we ran with. Definitely a pleasure. Particular thanks goes to Tippmann who supplied the X7 Phenoms that just plain rocked, Valken and Medusa for the soft goods that we absolutely depend on, Furious for barrels that performed flawlessly, Guerrilla Air for issue-free tank performance and Pinokio for entrusting us with a prototype hopper worth more than our rental car. Just "sic." Also thanks to Wolf, who interviewed George "Hitman" Gallagher for the Medusa and now famous "kill-o-meter," and hanging out with us with our friends at Pinokio. In summary, if you haven't been to Living Legends, put it on your calendar for next year. Beyond the scenario, you'll meet legends of the game and see all the latest gear in one place. 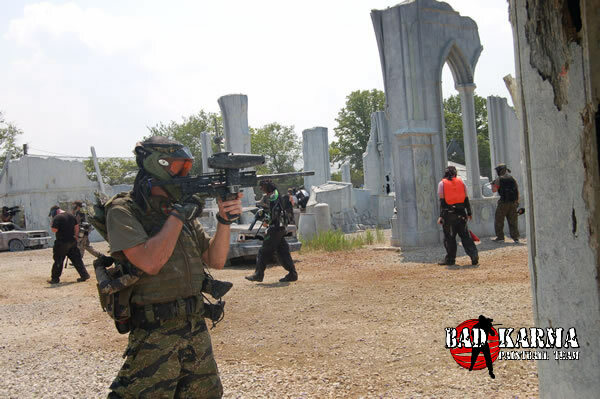 Definitely one of paintball's premier events that you don't want to miss. See you next year!